Sir Isaac Newton discovered that objects in motion tend to stay in motion with the same speed in the same direction unless acted upon by another force. This is a natural law. Think about riding a bike, for example. Imagine that you are speeding down a hill on a straight road. Suddenly, the road curves to the right. If you can’t slow down in a big hurry, what is going to happen? You’ll go off the road, of course. Newton further discovered that objects at rest tend to stay at rest. These are natural laws that apply everywhere in the physical world. Scientists call this phenomenon: inertia. Inertia exists in the animal world, too. A rocky mountain hiker once came upon a sheep stuck in a ravine. He pulled and tugged at the sheep to try to free it. Finally, with all his might, he pulled the sheep to the top. He turned his back for one moment, and, you guessed it, the sheep had fallen back into the ravine. It wasn’t until he rescued the sheep again and then drove it away, that the sheep was able to go to safety. What does this have to do with you and me? Plenty. 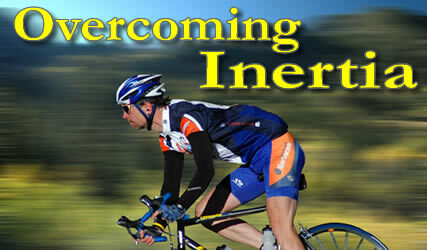 You see, the laws of inertia apply to our emotional and intellectual life as well. Have you ever decided that you are going to change something in your life once and for all, only to find that with out realizing it, you have slipped back into the same pattern again? We all get stuck in a rut sometimes. The trick is to exert enough consistent force to be able to overcome inertia and create lasting change. And the key to this is time and consistency. We’ve all heard that it takes 21 days to change a habit. This is true because, like the sheep in the ravine, we tend to slip back into old, comfortable ways. Think about a New Years resolution that you made this year. How is it coming? If your goals have fizzled a bit, here are some concrete ideas to help you overcome inertia and get back on track. Write out your goal along with your detailed plan of how you are going to accomplish it. Be as detailed as you can so it becomes real to you. Review the goal daily as you work your plan. Don’t let your mind become distracted or disoriented. Follow your plan. Remember, it is going to take extra work for the first several weeks. Nothing worth doing comes easy. Change is difficult. But, if you can stick to it consistently for a full 3 weeks, you will find that it slowly becomes easier and easier. Stay with it and you will win! I really enjoyed reading your article. It really tackles the issues that I deal with everyday of my life. Many times I determine to do something once and for all only to find myself back in the daily routine. Your article helped me to see why I can navigate my way out mental inertia. Thank you very much.